I wrote my Halloweeny decorated letter in response to this beauty from the Goodnight Little Spoon lady. 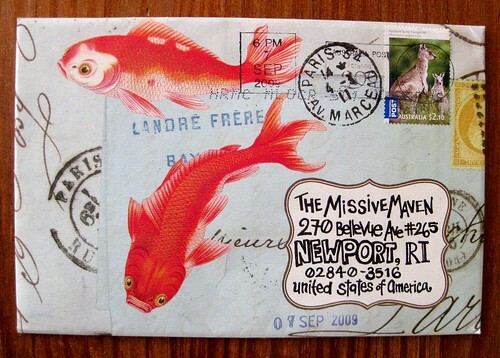 What an envelope!! 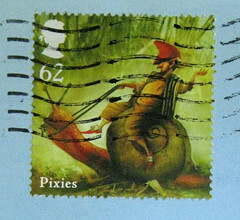 It came printed this way, Cavallini has some tres gorgeous envelopes, and it was so delightful to pull this baby out of my mailbox. The way she addressed it is so artistic and creative in the letter formation, too. I love the 3-D pop-up HI, and am kind of amazed it arrived unscathed from so far away. yeah me too especially when I send a really nice envie I have worked so hard on and then wallah it ends up torn , ripped or god knows what from the lovely post office machines LOL !!! Lovely! 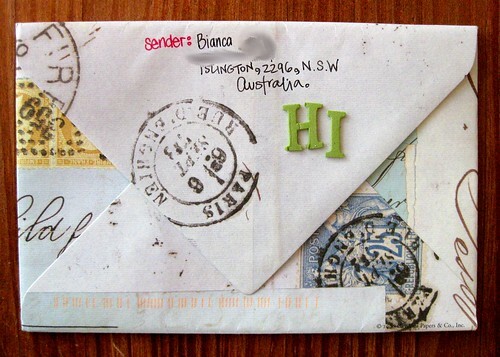 Bianca is making such gorgeous mail art! Like the Australian good fish envelope and Kangeroo stamps.I have a dollar coin from Australia with a Kangaroo on it. This is something I would like either to receive or then send by myself! That is so cute! How special to receive something like that.